For decades the island of Manhattan turned its back on its waterfront. 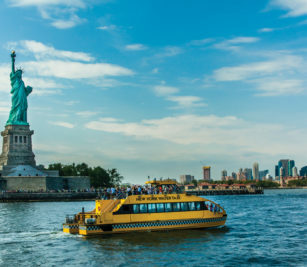 But from stunning riverfront parks to expanding water-taxi routes to Hudson Yards—the largest private development project in U.S. history—New York is finally paying attention to its perimeter, and becoming a more vibrant city as a result. Until relatively recently, it was entirely possible to live in Manhattan, hemmed in between, say, 10th Avenue on the West Side and York on the East, and forget that you resided on an island. The West Side Highway and FDR Drive both pushed Manhattan residents away from the Hudson and East rivers—and most New Yorkers rarely headed to the island’s southern and northern ends. It wasn’t always so. New York’s waterfront had once been alive with shipping, cruise lines and industry; in the early 20th century New York Harbor employed some 40,000 longshoremen. In the post-World War II years, those docks became a bastion of organized crime, and over the decades the shipping and industry migrated elsewhere—mostly, to New Jersey. Particularly on the West Side of Manhattan, the waterfront devolved into a mass of abandoned piers, rusting railroad tracks and desolate warehouses. The industrial waterfront “has largely receded from the city’s consciousness,” a New York Times writer observed in 2017. Today, that gritty industrial milieu has given way to a more modern New York vibe. The city’s new waterfront is alive with sparkling waterfront parks, bike and running trails in near-constant use and ferry boats sashaying across New York Harbor, up the West Side and along the East River. The result is more opportunities for residential life, recreation and commerce—plus a jolt of new energy for a city that thrives on perpetual reinvention. On the West Side, the High Line, a wildflower-infused walkway that had been an abandoned elevated railroad track, is now one of the city’s most popular attractions. During the 1990s, then-mayor Rudy Giuliani wanted to tear it down; community activists succeeded in preserving the railway. Opened to the public in 2009, the High Line now runs 1.45 miles north from Gansevoort Street in the Meatpacking District to 34th Street near Penn Station. More than 20 million people had taken a stroll on it by 2014, taking in the sun, fellow pedestrians, impromptu art exhibits, the glorious Hudson River Park and the surrounding cityscape. The path also offers a sweeping vantage point from which to watch construction progress on the most ambitious private development project in the United States: the 28-acre Hudson Yards. When the project is completed, 125,000 people will either shop, work or live at Hudson Yards every day. 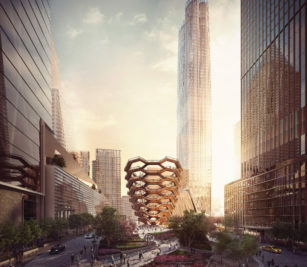 “It’s going to create a new heart of New York,” predicts Jay Cross, president of Related Hudson Yards, which is in charge of the project from developers Related Companies and Oxford Properties Group. “It’s the ultimate live, work, play environment.” Developers aren’t known for understatement, but it’s true that Hudson Yards is going to have an enormous impact on a once-dreary part of the city. Project plans include dozens of restaurants and stores, along with a 750-seat public grade school, all surrounded by patches of green. A multi-arts center called the Shed is scheduled to open in spring 2019 under the artistic direction of performance art impresario Alex Poots. The Related Cos. estimates that in 2025, when the project is completed, 125,000 people will either shop, work or live at Hudson Yards every day. 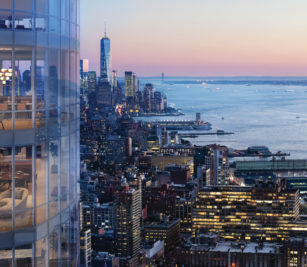 One of Hudson Yards’ biggest selling points is its access to the water and views of its namesake river. “We’re reclaiming our waterfront,” Cross says. The southern tip of Manhattan was ravaged by the Sept. 11, 2001, attacks and, in 2012, Hurricane Sandy. But now, this area too is experiencing a resurgence. One example: Along the East River, ferries travel from Brooklyn’s new Brooklyn Bridge Park to the revitalized Seaport District. “We call it the Port of Discovery,” says David Weinreb, CEO of Howard Hughes, the developer transforming the Seaport. It’s a district that was New York’s first commercial hub when the Dutch West India Company founded an outpost there in 1625. Five historic shipping vessels are still docked at the South Street Seaport Museum. But the port activity went away, and in recent decades the Seaport was known mainly for its generic national chain stores and streets that visitors abandoned at night. But amidst some of the city’s oldest architecture, there are dramatic signs of new energy. One is the newly built Pier 17, whose glass walls can open to the waterfront. ESPN opened a studio there in April—a site chosen, according to the network, because of its stunning Brooklyn Bridge backdrop. And this fall, restaurateur Jean-Georges Vongerichten will open a seafood place in the pier. On its rooftop, Pier 17 is hosting concerts overlooking the iconic Brooklyn Bridge. “Everything we’ve done, we’ve done with the waterfront in mind,” says Weinreb. These developments are driven by the strength of New York’s economy. For more than a decade, job growth in New York has outpaced the rest of the United States, with 4.5 million people on local payrolls as of December 2017. And last year, a record 62.8 million tourists visited the city, according to NYC & Company, the city’s official tourist bureau. To be sure, New York’s success has created its own challenges, including the city’s aging infrastructure, particularly its deteriorating subway system. The development of Hudson Yards demonstrates the subway’s importance: For the project to move forward, the city had to agree to spend $2.4 billion to extend the No. 7 line to a gleaming new station, where a two-story escalator brings commuters up to 11th Avenue. Likewise, a big draw for the Seaport is its location next to the Fulton Street station complex. There, eight subway lines converge, making the Seaport only a subway stop (or ferry ride) from Brooklyn—whose own waterfront is being so dramatically revitalized, it merits an article of its own. The nosebleed prices of New York real estate point to the biggest challenge for many New Yorkers. “Prices are too high,” says Kenneth T. Jackson, a history professor at Columbia University. “In the 1970s, people were escaping from the city. Now they’re not.” The city’s population, estimated at 8.54 million as of July 2016, keeps rising. The resulting exorbitant real estate market makes the city tougher for those who help fuel New York’s ongoing reinvention: the immigrants who work in local low-wage industries, young professionals and the creative class that has made New York the cultural capital of the nation. One of the city’s answers to population growth is to invest in commuter ferry services. In May, mayor Bill de Blasio announced the city will spend an additional $300 million to expand that service and double the capacity of its fleet, on top of some $390 million already committed. The reason was ridership numbers: Projections are that that NYC Ferry will attract 9 million riders annually, more than twice the number initially expected. One of the places those riders may go: a public park now under construction at Pier 55 on the Hudson funded (at a cost of about $250 million) almost entirely by media mogul Barry Diller. “Diller Island” will be an entirely new space, elevated over the water on 132 concrete, mushroom-shaped platforms. It’s a remarkably ambitious project emblematic of New York’s renewed desire to connect with the water around it—and its rejuvenated ability to dream.